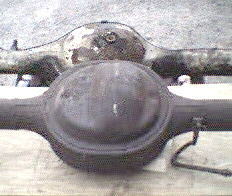 Ford used the 9 inch rear from around the 1957 model year right up until the early 1980’s in cars and trucks. 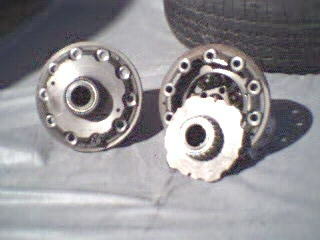 It was not the only axle used, but was by far one of the best. 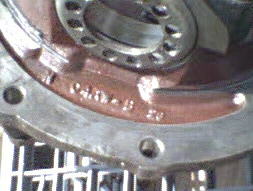 Variations by Ford exist in the size of the outer axle bearings in the housings and carriers both, as well as with the spline count on the axle shafts. 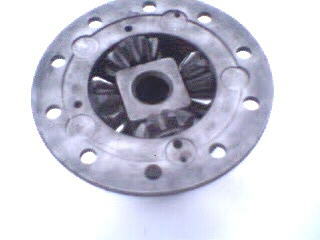 Generally most cars received the small axle bearings and 28 spline axle shafts. 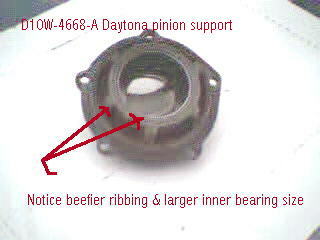 Exceptions to this were the ultra Hi performance Boss 302’s, Boss 429’s, 427’s, 428 CJ/SCJ and the 429 cars which received the 31 spline carriers and axle shafts. 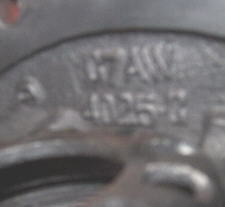 Some of the heavier cars like the Galaxies also received the larger wheel bearing housings.The trucks varied more, early half ton trucks got the 28 spline axles and carriers, while sometime in the early 70’s the switch was made to mostly 31 spline axles and carriers for most trucks. 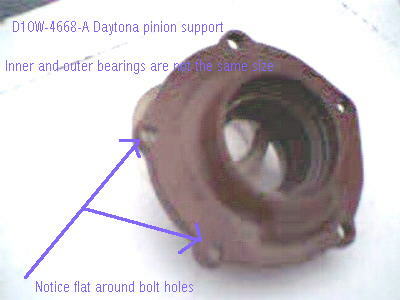 Most of the later trucks also received the larger axle bearings housings.One exception to this was the Bronco’s from 1966 to 1977, they stayed with the 28 spline units. 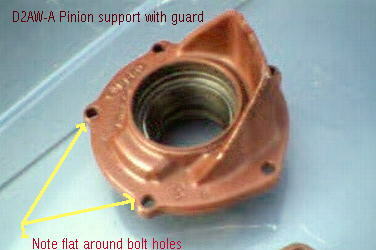 A small bearing housing can be differentiated from a large bearing housing by the size of the nuts and thread used to retain the brake backing plates to the housing, the small bearing housings use 9/16 socket size nuts with 3/8” fine thread, while the larger bearing use 11/16” socket size and 7/16” fine thread. 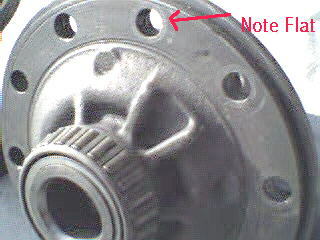 Gross Vehicle Weight ( GVW ) would determine which axle housing many cars and trucks received. 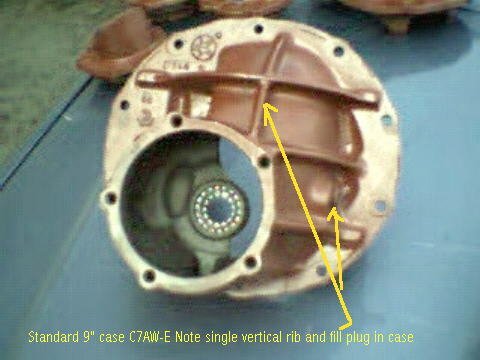 The carrier housing I see most is the C7AW-E, it is the one most commonly found in the trucks right up until around 1982. 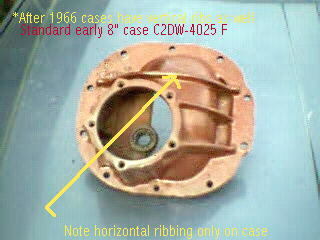 I am not sure if this “E” version of the case came into use in 1967 or in subsequent years, but it is by far the most abundant case being used in both full size Ford cars and trucks throughout the 1970’s. 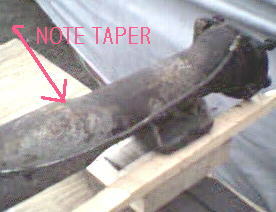 I have heard that it has a higher nodular iron content and better casting than the earlier single ribbed cases it replaced and that is why it remained in use so long, and the double ribbed N case was no longer needed for passenger car/truck applications (this also coincided with the demise of most performance engine options in the 70’s)- I have never seen this substantiated however. Most carriers I have seen for sale at swap meets/ car shows are this C7AW-E case which leads me to believe most were pulled from trucks and cars from the 1970’s. 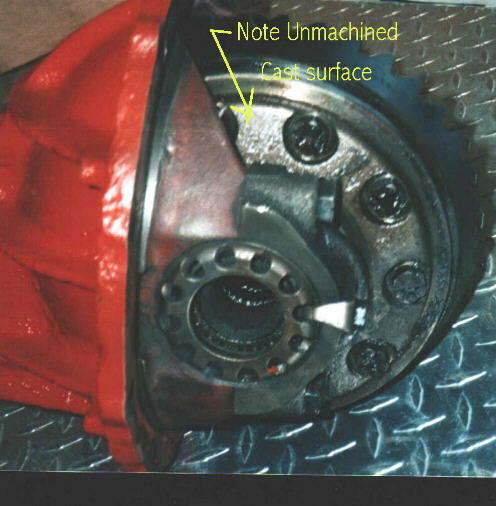 Axle housings as noted in the examples below also evolved over the years, the earlier housings used in cars from 1957 to mid 1960’s tended to be the weakest and had abrupt ending but welded carrier centers to tubes and a smooth backside. 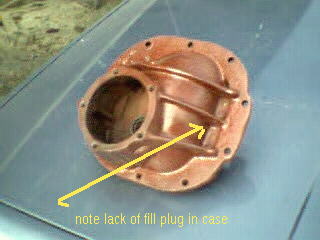 Later housings appeared in either 1966 or 1967 with the familiar “Hump” in the backside middle and stronger tubes.The later truck housings received even beefier center carrier housings and tubes and this style of center carrier housing is best suited for drag cars or narrowed rear ends in my opinion due to the added strength in the middle. 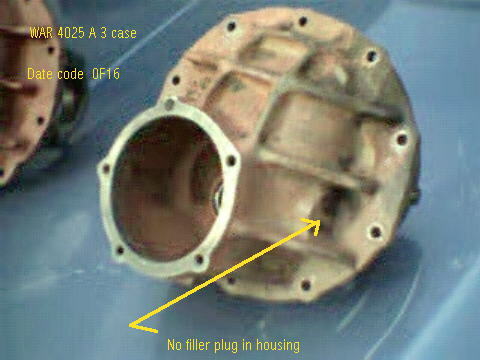 Most of the early housings are ok for the average street performance cars. 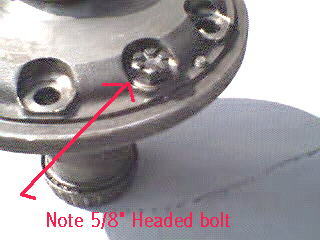 The popular early swap being the 57 to 59 Ford for the 65/66 Mustang.I haven’t completed an axle housing width chart yet, but here is what I can tell you about some that I have seen, they often group Mustangs and Fairlane axle housings together as often it is true they are the same width, but I can tell you for a fact, the distance between spring perches is different between Mustangs and Fairlanes.Spring perches must be cut and re-welded inorder for the swap to be performed. 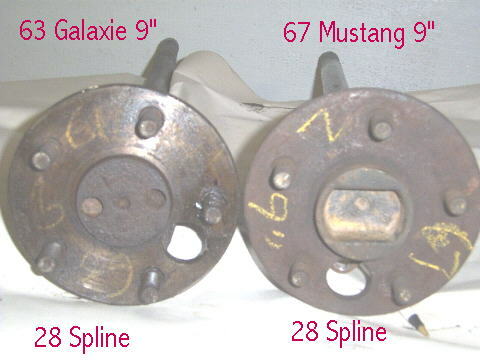 The “rough “ widths I keep in mind for Mustangs are the following: 52” for 1965 to 1966 (the same width as 64-65 Falcons and 62 to 65 Fairlanes-as in the Mustang line, most however never received a factory 9 inch), 54” for 1967 to 1970 (same as 66 to 69 Fairlane,Torino,Comet & Cyclone non station wagons-cars with 351 and up engines received 9 inch units-as did some 302 4V cars with optional gear ratios) and 56” for the 1971 to 1973 Mustangs-cars with 351 engines and up receiving the 9” housings.Keep in mind as mentioned, the Fairlane spring perch distances were not the same as the Mustang. All the Galaxies I have seen from throughout the 1960’s used the 9 inch rear, regardless of engine size. 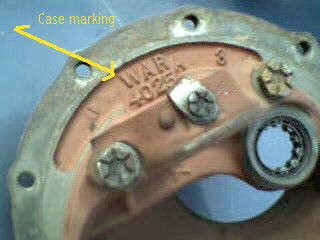 I have heard various stories as to the reliability of the WAR marked cases, some say avoid them like the plague, others say this is false.Here is what I understand, while having the extra ribbing like the N case, they do not have the nodular iron content and are prone to cracking at the bearing support.They seem to have been used on the 57 to 60 Fords from casting dates I have seen. 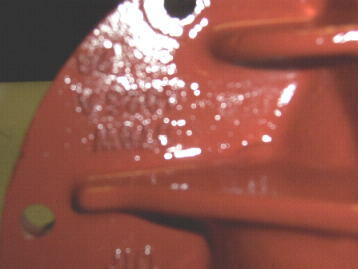 Standard or WAR cases, were cast in gray cast iron which has a grain structure that does not have the best shear strength characteristics. 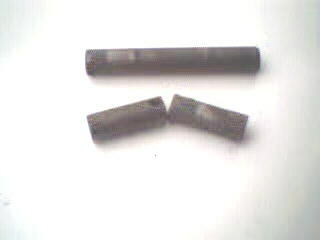 The N stands for nodular iron, which is made by adding magnesium to molten iron. 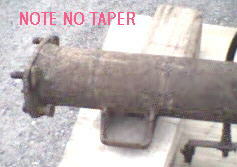 What this does is change the grain structure from flakes to nodules - much stronger and less likely to fail under shear load. 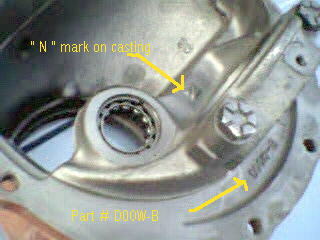 Here is the early N case, the C4AW-B casting, which can either have the N or not. 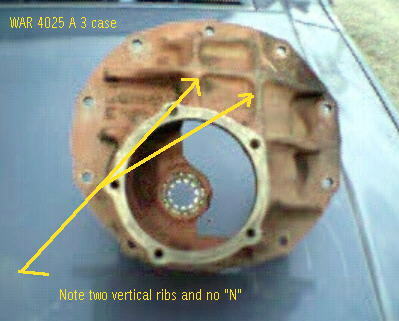 Some standard cases are also machined to take the larger 3.063 side bearings, most cases however (including N cases) will take the 2.892 side bearings. 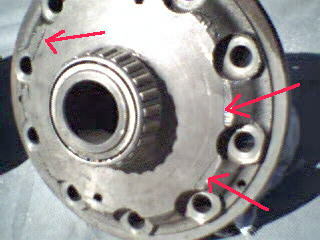 Aftermarket spools and cases are available that accommodate even larger bearings-3.250" and 3.812", but Ford used just the two sizes from what I have seen.The carrier I have seen with the 3.063" larger side bearings is the C7AW-G marked single ribbed case, it came from a late 60's Galaxie. 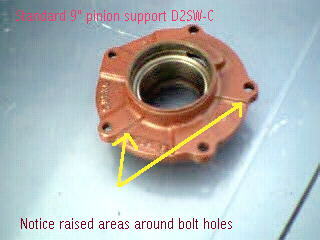 Other standard pinion supports encountered: WAT B2(on a WAR case),C0AW-A,C6AW-4668-A,C7AW-C(guarded support as well) and a D2SW-4668-C(marked with the 4668).The D2SW-C seems to be the most common encountered through 1979 on the C7AW-E cases I have viewed. 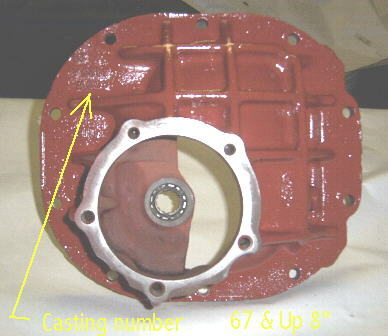 The casting number should be C2OW-4025-F, NOT C2DW listed for the case.Another later 8 pinion support with guard built in that I have seen had casting number C6OW (the 6 however may have been a 5-this support came out of a 65-66 mustang center). The two basic types of posi units (posi is the G.M. 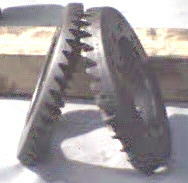 name for its positive traction system which has been become a part of the nomenclature) are the early Equa lock and the subsequent Traction lock units ( I will refer to them here as spools to simplify things). I am not exactly sure when the Equa-locs first appeared, early units are scarce  I havent seen many prior to 1964/65 and these are quite rare.From what I have seen the Equa locs were used up until 1969, which is when I believe the Traction Loc units first appeared. 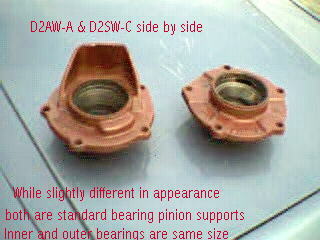 There are visual and internal differences between the two spools and most parts do not interchange. 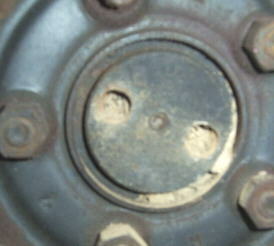 Shown above is an example of an equa loc in its carrier, you will note the recessed bolt holes and 5/8 headed bolts, as well the rough cast appearance of the cover assembly, it is not machined as it is in the Traction Loc units. 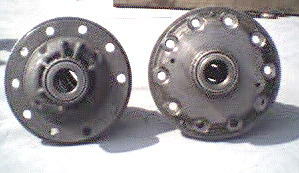 Internally the number of clutch disc and plates differs between the equa loc and trac loc spools, the equa loc having only 3 fiber plates and 4 steel with one large belveder spring applying force.The trac loc unit utilizes 4 fiber plates and 5 steel plates, with 4 smaller springs applying force.Both equa lock and trac loc units were available in 2 pin and 4 pin varieties, in either 28 spline or 31 spline versions.The four pin 31 spline unit would be more commonly found as a trac loc piece. 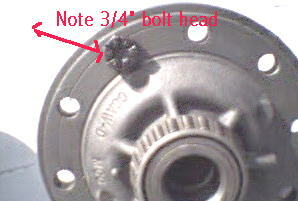 The four pin being the heavier duty unit utilizing 4 spider gears vs just two in the two pin variety (as noted in figure above a four pin variety will have actually just 3 pins and a two pin will in reality just have 1 pin- the number of spider gears is actually what is being referred to).Shown below are the internals of a four pin equa loc, note the five fingers on the steel clutch plates-the tiny circular tabs on outer edge- (trac loc units will have only 4). 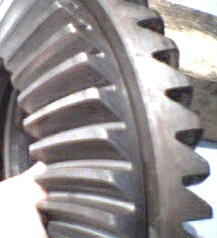 hese two gears are the same ratio- 3.00, but one is only 8 3/ 4 diameter, the other a true 9.When gear is installed in the case, a true 9" ring gear will have very little clearance between housing and large gear (most noticable at bottom), while an 8 3/4" setup will have almost enough room to put your finger tips into between gear and case (but don't due it- it can hurt).Don't feel slighted if you find you only have an 8 3/4" setup, they are plenty strong, Ford used them behind the HiPo 289 applications in many Mustangs and others. No guarantee as to the accuracy of this data. 1967-1973 medium and big block Mustangs and Cougars 1966-1971 Fairlanes, Torinos, Montegos, Comets, and other Ford intermediates with big blocks. 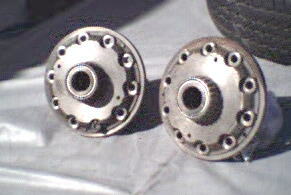 1967-1973 Mustang/Cougar - light duty, thinnest housing material, small axle bearings, 28 and 31 splines. 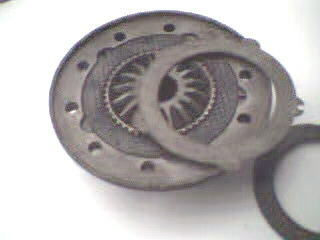 1957-1968 passenger car and 1/2 ton truck - medium duty, stronger than Mustang type, 28 and 31 splines. 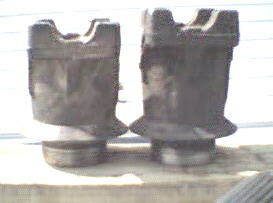 Ranchero/Torino - heavy duty thick wall housing, 3.25 inch diameter axle tubes with flat tops. 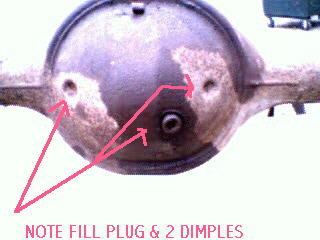 1957 - no dimples, flat center band up the center of the rear cover, bottom drain plug. 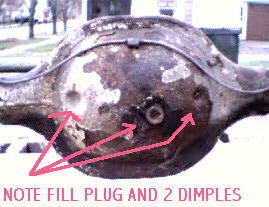 1958-1959 - two dimples on back of housing, flat center band, some had drain holes. 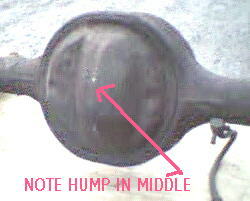 1960-1967 - two dimples, flat center band, oil level hole in back cover. 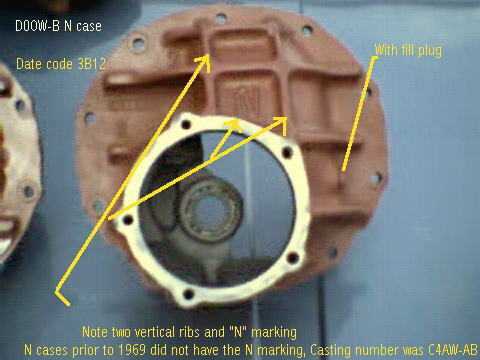 1963-1977 Lincoln, LTD, Thunderbirds had 9.375 inch centers, housings were cut away at the gasket surface for ring gear clearance, one curved rib at the front top portion of differential, strong but no gears. 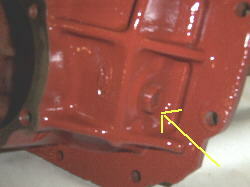 1972 and earlier 31 spline axles have the ability to be shortened. 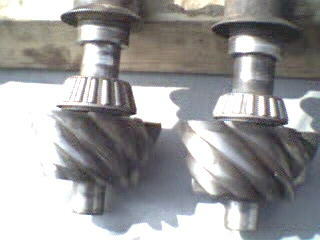 28 spline axles are tapered and cannot be shortened and re-splined. 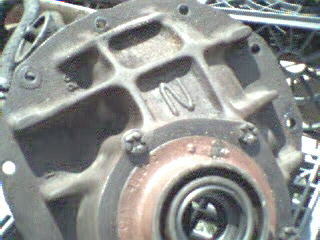 1973 and later cars have a 5-on-5 bolt circle and the axles cannot be shortened. 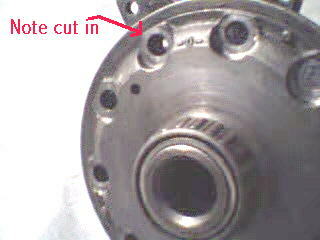 Oval hole = 28 splines. 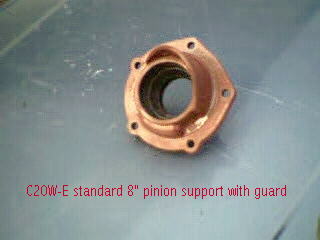 Two large holes and counter-sunk center = 31 splines.